It's been "Weird Al" Yankovic's year as the prolific pop parodist released his Mandatory Fun LP to widespread acclaim, and has continued to dominate our lives with a series of funny videos. At last night's Emmy Awards, he offered a series of new songs in a medley. Like he did in the closing credits of 30 Rock, Yankovic took the instrumental theme songs of some of today's best television shows and offered descriptive sing-alongs over their music. The shows he took on included Mad Men, Homeland, Game of Thrones and many others. There was also an appearance from Andy Samberg as GoT's Joffrey. 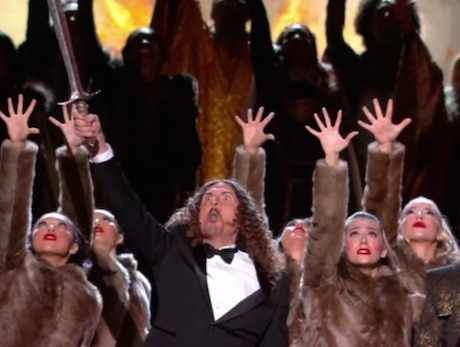 Watch Weird Al pay homage to today's TV shows on the Emmys below.